Inside-Out Sports was founded in December 1993 and opened its doors on February 19, 1994, in Raleigh, NC. With its narrow focus and outstanding customer service, Inside-Out Sports quickly established itself as the leading specialty running store in the Triangle. 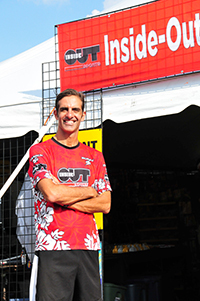 In 1995 Inside-Out Sports took ownership and title sponsorship of Triangle Triathlon and began expanding its involvement in the multisport market. In 1996 Inside-Out Sports moved to Ridgewood Shopping Center in the heart of Raleigh. This central and easily accessible location, along with a bigger sales floor and stockroom, allowed Inside-Out Sports to increase its retail presence in the region. In 1998 the growth of our mail order business led to the leasing of an additional mail order and office warehouse space. In 1999, we launched InsideOutSports.Com, an online triathlon superstore that has given customers across the globe access to not only our extensive inventory and unparalleled service, but also to the corpus of knowledge held by our experienced staff. Over the years, Inside-Out Sports has sponsored and supported numerous annual events, including the Raleigh Marathon, the Women’s Distance Festival, the Inside-Out Sports Classic Half Marathon (formerly Stonewood Classic) and the Inside-Out Sports Turkey Trot. Inside-Out Sports has also helped with the development and sponsorship of both the North Carolina and the Palmetto State Triathlon Series. Following on our successes as the exclusive multisport retailer in 2001 at Ironman USA and Ironman Florida, Inside-Out Sports expanded its relationship with Ironman North America to include all four U.S. Events in 2002 and 2003, including the inaugural Ironman Idaho and Ironman Wisconsin. In July 2002, Inside-Out Sports opened its new world headquarters in Cary, NC, in the center of the Raleigh-Durham area. 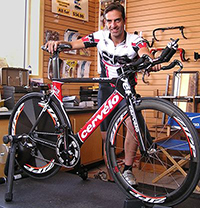 The new 5,000 sq ft free standing store contains a Computrainer for Dynamic Bike Fits. For stride analysis and to test running shoes we also offer a treadmill as well as an inside track. Despite all the technological investments we have made, it is our staff that make Inside-Out Sports successful. 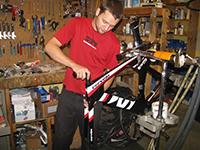 The industry experience and product knowledge our employees possess are unequaled in the triathlon market. Additionally, all the owners, managers, and employees are runners or triathletes themselves, meaning customers will receive outstanding service from athletes who are enthusiastic and take pride in their jobs.